For many, finding a Stretch Marks Removal Treatment that works can become an obsession. Frustrated after trying every lotion and potion without success. Dermaeraze is different in that it’s an in clinic procedure. It’s an alternative to more invasive hit and miss laser treatments. We encourage you to read on and do your own further research into DermaEraze. What can our Stretch Marks Removal Treatment offer? DermaEraze Stretch Marks Reduction Treatment can offer a permanent improvement to the affected area with a 95% success rate. We define success as a 40% to 80% improvement with one treatment.With over 1500 procedures performed in the past 18 months, no other stretch marks reduction treatment comes close. You can see more Before and After pictures after one DermaEraze stretch marks treatment here. DermaEraze is a procedure developed by Lorena Öberg for the treatment of stretch marks and scars and it has been hailed in the national and international press. An easy internet search will show what others are saying about DermaEraze Stretch Marks Treatment. Our stretch marks treatment works on all skin types, including African and Asian skin and has a minimal down time. Fully healed results can be seen in 6 to 8 weeks although the area continues to improve for up to 6 months after the treatment. Our stretch marks removal treatment is very low risk and you can carry on with your daily activities straight away, although you will experience mild discomfort for 24 to 48 hours. We do not use pigments or magic creams. Nor do we inject anything into the skin and therefore this treatment is considered Halal. We call on your body’s own natural healing mechanism to repair the stretch marks. Consequently, the complication rate of this treatment is extremely low. For more Frequently Asked Questions about DermaEraze, click here. Read about DermaEraze in press and independent review sites. 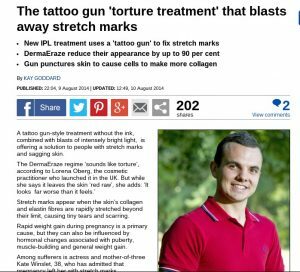 DermaEraze stretch marks treatment has been featured in the Health Section of the Mail On Sunday as well as various other publications. Although we feel that the headline in the Mail is a bit OTT, the article is very fair and honest. We invite you to read it by clicking on the photo below. Article in the Health Section of the Mail on Sunday. Click to view full article. DermaEraze is also mentioned in Grazia as one of the five top treatments. We’re also very happy that our clients have taken the time to talk about their experiences in RealSelf.com. DermaEraze has become the go to treatment for celebrities. We are not at liberty to discuss which celebrities have had the treatment but Natasha Hamilton has gone public in Closer Magazine. You can read what Natasha Hamilton says about it here. 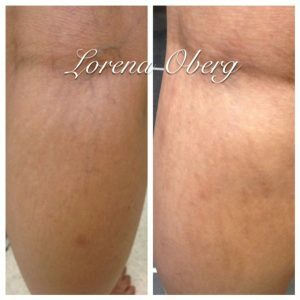 Read this great BLOG about DermaEraze stretch marks treatment! If your stretch marks are new and pink, you may not need us. There is hope to heal them naturally. See our page on Tips for Healing Fresh Stretch Marks for advise on things that you can do NOW at home. If however, they have been pink for over three years, do get in touch as we will be able to help you. Unfortunately, there is a strong genetic element to getting stretch marks. Some occur during puberty as the skin struggles to keep up with growth, whilst the most common, are pregnancy and weight related. It is not uncommon in the body building community to get stretch marks. Prices start from £250 and a consultation is required. You can book a consultation online by clicking here or on the button on the upper right hand corner of this page. If you have any questions you can call us on 01883 344273.